SPORTSAID WEEK 2019 TAKES PLACE FROM 23-29 SEPTEMBER. PLEASE CLICK HERE TO REQUEST YOUR FREE FUNDRAISING PACK (http://r1.dotmailer-surveys.com/86a690f-593ruv89). Fundraising is a key income stream for the charity and SportsAid Week has generated close to £150,000 since 2016. 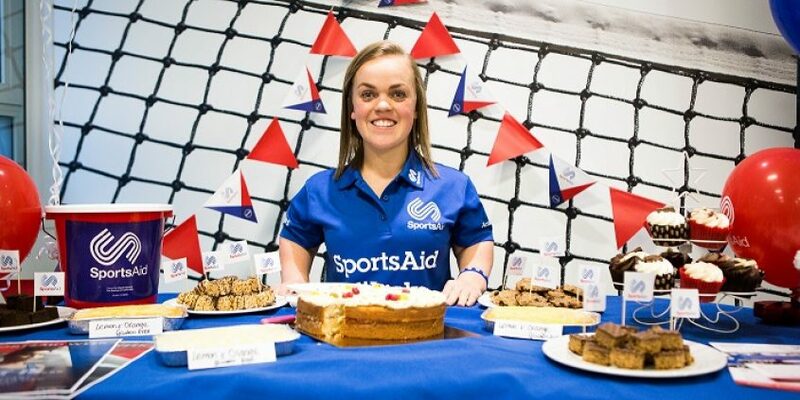 The annual initiative is being supported by five-time Paralympic champion Ellie Simmonds OBE and Laura Wright, the UK’s leading classical artist, who both return as SportsAid Week ambassadors for the fourth consecutive year, alongside six new additions. British athletics stars Laviai and Lina Nielsen, and professional boxer Viddal Riley, who is signed to Mayweather Boxing, have all benefitted from SportsAid support in recent years. TV presenters Gabby Logan, who represented Wales in rhythmic gymnastics at the Commonwealth Games, and Ade Adepitan MBE, a Paralympic bronze medallist, are previous SportsAid recipients. World record holder Susannah Gill ran seven marathons across seven continents in seven days to raise over £19,000 for SportsAid earlier this year. She will be leading the charge as the #MyMiles Challenge returns and calls on SportsAid supporters to keep the country’s brightest sporting prospects company as they train and compete throughout September. Here’s all you need to know about SportsAid Week 2019 to get you started…. SportsAid helps over 1,000 athletes across more than 60 sports each year, the majority aged 12 to 18, by providing them with an average award of £1,000. SportsAid Week is a fundraising drive designed to support the country’s most talented young sports stars as they strive to represent Team GB and ParalympicsGB at future Olympic and Paralympic Games. All the money raised assists athletes with training and competition costs, including equipment, accommodation and transport, during the critical early stages of their careers. The initiative also acts as an opportunity to shine a spotlight on SportsAid and the work the charity does to provide athletes and their parents with support at the beginning of the talent pathway. SportsAid Week really is for everyone. You can sign up for a fundraising pack (http://r1.dotmailer-surveys.com/86a690f-593ruv89) today and take the first step towards planning your involvement. It really is up to you as to how you show your support – whether it’s on your own or with friends, family or colleagues. You decide the size of your event, no matter how big or small, and see how much you can fundraise for the charity! These are just a few ideas for fundraising activity you could undertake which have proven to be popular in previous years. Please email Grace Hughes, SportsAid’s Partnership and Activation Manager, on sportsaidweek@sportsaid.org.uk if you have any questions about SportsAid Week 2019 and she’ll look to assist with your plans for September! The #MyMiles Challenge is back….and it’s bigger and better than ever! The idea was inspired by data from SportsAid’s athlete survey which revealed that talented young athletes cover around 40 miles, on average, in training every week. The challenge is encouraging fundraisers to undertake physical activity throughout the whole of September. This year the charity has linked up with Race Nation. You can choose your own distance, do a #MyMiles Marathon of 26.2 miles or reach 40 miles to match the athletes. The current total is just shy of 20,000 miles – meaning nearly 500 of the country’s brightest sporting prospects have been kept company so far! Race Nation will also allow you to set up a sponsorship page if you wish. There’s lots of inspiration you can take from last year’s activity on how best to undertake the challenge. We would encourage you to post your miles on social media and spread the word by making a nomination to continue the chain. 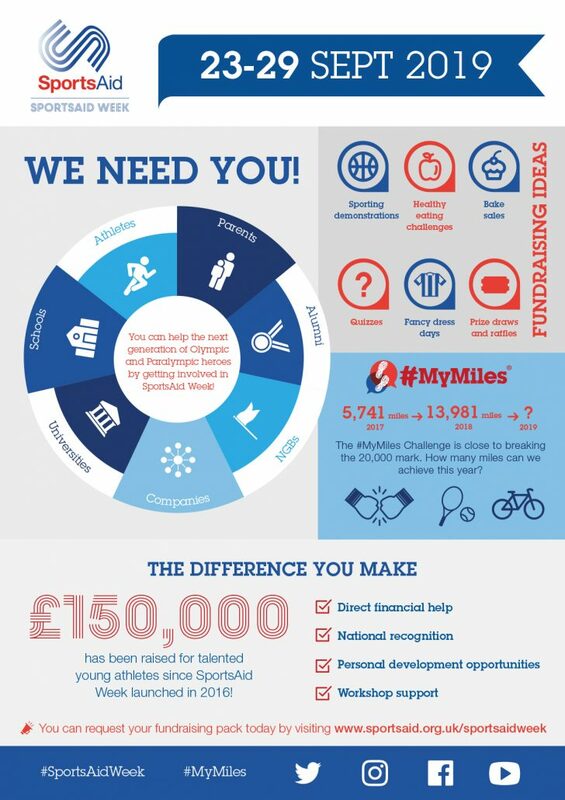 Please visit www.sportsaid.org.uk/mymiles for more information. The #MyMiles Schools Challenge is the perfect way to inspire pupils with the stories and achievements of young sporting role models across the country. Schools are able to reinforce the importance of being active and leading a healthy lifestyle by asking pupils to complete a minimum of one mile in SportsAid Week and donating £1 to the charity to take part. There will be a dedicated #MyMiles Schools Day on Tuesday 24 September, but if that doesn’t work for you, select any date during the week. You can run an assembly – in advance of your planned activity – teaching pupils about the history of British sport, and the role SportsAid has played within this, to help give them a clear understanding as to the athletes they’re supporting. There will be a number of surprise visits made to schools by SportsAid athletes, as well as competitions for the most miles covered, best photos and the most creative ideas! SportsAid has produced a simple-to-follow guide – FREE to download – on how schools can take part in the #MyMiles Schools Challenge. You can also order your free #MyMiles Schools pack. Please visit www.sportsaid.org.uk/mymilesschools for more information. WHAT DIFFERENCE DOES FUNDRAISING MAKE? The money you raise during SportsAid Week will help to support athletes in many different ways – no matter how big or small the amount may be! They don’t just feel the impact of SportsAid’s backing from a financial point of view – the award acts as a motivational boost and provides recognition of their talent as they look to progress towards their sporting ambitions. SportsAid athletes benefit from a range of personal development opportunities enabling them to broaden their skillsets. Many receive expert advice through workshops, delivered by the charity, which focus on areas such as nutrition, performance lifestyle management, sports psychology and telling your story through the media. They can also access mentoring through buddy schemes. SportsAid has helped tens of thousands of athletes during the critical early stages of their careers. The charity’s impressive track record was highlighted at the Rio 2016 Olympic and Paralympic Games where alumni won 150 medals. This included 46 of Team GB’s 67 medals (20 gold, 15 silver, 11 bronze) and 104 of ParalympicsGB’s 147 medals (44 gold, 28 silver and 32 bronze). SportsAid Week 2019 takes place from 23-29 September. You can keep up-to-date with all the activity before, during and after the initiative by following the charity on Twitter, Instagram and Facebook. Thanks for your support!